On Point was a member of the 2016 Denver Champion Pen of 3 and the pick of the 2015 Coyote Ridge calf crop by Dave Allan and John Sullivan. His full sister was a many time Champion for Hoffman Ranch including the Denver Jr Show and produced two of the high selling heifers in their 2016 production sale. 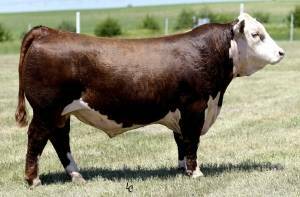 On Point is big ribbed, stout and sound with an outstanding dam that is considered by many to be the best looking and best producing cow in the Coyote Ridge Ranch program.